YTO garbage compactor can push, spread, pulverize, demolish and compact refuse. It will help save the land, protect the environment and prolong the service of refuse landfill site. As a professional garbage compactor manufacturer in China, we can provide a wide range of trash compacting machines to our customers. The available models are LLC228, LLC226, LLC223, LLC220, LLC233H and LLC230H. 1. LLC228, LLC226, LL223 and LLC220 garbage compactors are fitted with torque converter and power gearshift transmission. 2. Every wheel of LLC230H and LLC233H trash compactor is independently driven by static-hydraulic pressure. 3. The wear resistant teeth are arranged specially. Two scraper bars and two wire cutters on four compaction wheels will effectively prevent the wire wrapping around and keep the wheel clean. 4. The hydraulic system uses piston pump with load sensing system as the power element. It is easy to control, highly efficient and energy saving. 5 The frame of our garbage compactor is designed with Roll-Over Protective Structure. 6. Service brakes on the front and rear axles and central parking brake will provide reliable security guarantee for LLC228, LLC226, LL223 and LLC220 trash compacting machine. Traveling brake of LLC233H and LLC230H trash compactor is static-hydraulic brake and every each hub reducer is equipped with SAHR brake. 7. Infrared video monitor system and backup buzzer provide increased rear view for driver and make the operation much safer. 8. Standard garbage compactor is equipped with Chinese engine. Furthermore, LLC233H and LLC230H trash compactors with CUMMINS engine are also available. 9. The gradeability of our trash compacting machine is 100%. The maximum travel speed of LLC228 and LLC226 trash compactor is 10.9 km/h, of LLC223 and LLC220 trash compacting machine is 10 km/h, of LLC233H and LLC230H garbage compactor is 8 km/h. 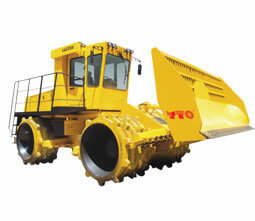 For more details about the parameter of the construction machinery, please refer to the parameter table. In addition, we also offer combine harvester, forklift truck, tractor trailer, diesel engine, etc. Please feel free to contact us if you are interested in any of them. We look forward to cooperating with you.